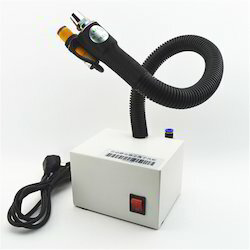 We are manufacturere for ionizing air gun /ionizing nozzel with stand. 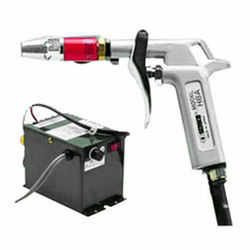 Hot air gun / Deionized air gun is mainly used to eliminate static charges or static electric charge and blow off contaminants from the surface of laminated woods, plastics, rubbers and glass. At the same time the neutral surface doesn't re-attract airborne contaminants from the manufacturing process. If the compressed air is ionized, the static charge will be eliminated, which allows superior quality cleaning without re- attraction. Discharges 2 seconds at 12"
Features: 1.covers extensive area, adjustable airflow2.with lamp (warn air can be added optionally)3.two or three airflow output.4.optional warm air function.5.input voltage 110v/60hz, 220v/50hz.6.ion balance: 0v¿¿¿10v.7.wide range of application, mainly suitable for electronic products processing and assembly, rolling of folding and coating of film and atripping of mold productsetc.specification: input voltage: 110v/60hz, 220vcurrent consumption: 0.9a/0.45aoperating temperature: 0-50. O. Cweight: 11.7kgair volume: 120-330cfmsize: 1100(l)*170(w)*120(h)mm. Anti-static workshop and clean workshop. 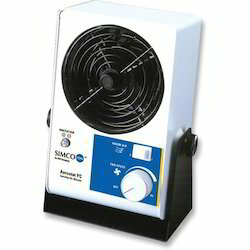 Snake type ionizing air blower can eleminating dirt or static which is hard to reach or touch. the snake tube can be changed angle to make the nozzle aim at the object, Don't be operated by hand, It can blow aiming at the object directly. Air flow controller can control air flow, Placed easy and convinient. easy to change ionizing needle. The ionizing air nozzle with small size is easy installation, safe and reliable working under high voltage and micro current.